The arthritic cycle represents the continual degradation and imbalance of chemical and physical processes within the joint. Arthritis can be initiated by a range of external factors, such as joint trauma. Once the arthritis process is initiated there are multiple processes that undergo a deteriorating cycle. Three of these are discussed below and shown in the diagram following. Cycle 1 – Blood Blockages – An immune response is triggered which causes blood vessel blockages. This leads to poor nutrition to the joint and cartilage degradation. Cartilage degradation then causes further immune response. Cycle 2 – Joint Fluid Failure – An inflamed joint causes a reduction in the quality and production of joint fluid. With a reduction in the lubrication of the joint, further stress and friction are applied to the joint cartilage. Further cartilage damage results, causing further inflammation. Cycle 3 – Protein Breakdown – Abnormal joint structure from cartilage failure leads to the production of enzymes that breakdown key joint proteins. These enzymes lead to the breakdown and destruction of cartilage. Further cartilage degradation results in further joint abnormalities and a re-initiation of the cycle. 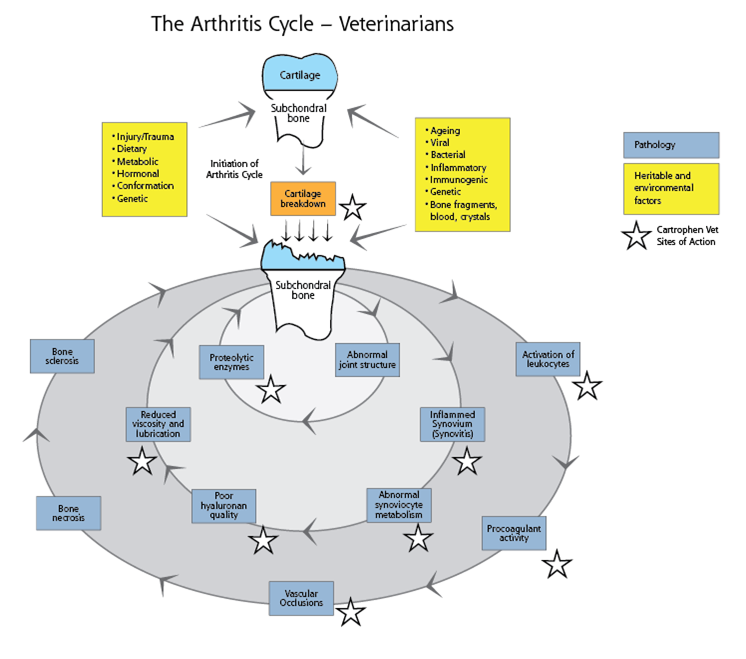 Below is a graphical representation of the arthritis cycle. It shows the healthy joint at the top, with a range of external factors influencing the joint, from hereditary and genetic problems to injuries and trauma. The external factors help initiate the arthritis cycle. Once initiated, there are various pathways of the disease that continually deteriorate without proper treatment and care. Todhunter RJ and Lust G. (1992) In Auer JA, editor. Equine Surgery. WB Saunders Company Ltd, Philadelphia,: 844-866 and Fubini SL et al. (1999) Can J Vet Res; 63:253-260.